Another illegitimate ebay seller is trying to hock some new third jerseys — including some that haven't been released yet. And it's the pictures that were posted that have me writing today. If you're interested in the Lightning, Flyers or Coyotes third jerseys, I've got you covered. Still no pictures for the Senators, Stars, Kings or Sharks yet — but I'm working on it. These new images give us a better look at how the lettering and numbers will look on these sweaters. We'll start with the Coyotes. When I leaked the first images of their new third jersey, many wondered what color the numbers would be and if they would even use the same format as the home and road sweaters. I can now answer those questions. Sand and yes. 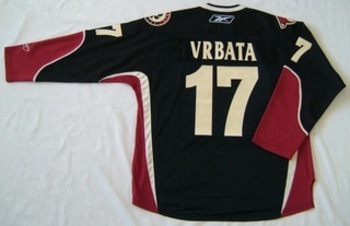 Although obviously that jersey was made some time ago because Radim Vrbata plays for my team now and Todd Fedoruk snatched up No. 17 in Phoenix this year, I think you get the idea. We've already seen the number and lettering styles on the Lightning and Flyers third jersey, but these pictures offer a better look. 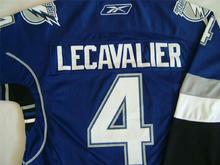 The Lightning will go with white numbers trimmed in blue and silver (no black!) and white letters for the nameplate. 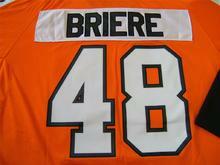 The Flyers will don white numbers trimmed in black with black letters on a white nameplate. I really like that look. I just hope it isn't one of those things that starts getting copied. Just because I like something doesn't mean I want to see every team do it. There were a lot more pictures than what I've posted here so I recommend taking a trip to Third Jersey Central to see the rest. There were also a few new photos of the Thrashers' third jersey. Keep in mind that all of these images depict Rbk Premier jerseys and not authentics, by the way.